Home > #1 Source For Roland Vinyl Cutters - Hobby to High Production! 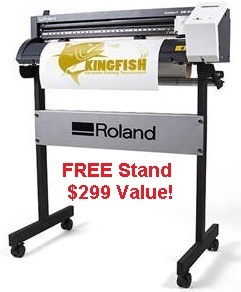 > Roland GS-24 Vinyl Cutter, FREE Stand Incl $299.00 Value - Act Now! FREE STAND INCLUDED - A $299 Value! This cutter is no hobby cutter, it is the best in its category. A real work horse and the choice of professionals! With a newly-designed LCD panel, precise blade groove on its apron for easy manual cutting, and an included roller base that keeps feeds straight, we made sure the GS-24 is as easy to use as it is technologically-advanced. Plus, with its completely re-designed cutting carriage and blade holder, the GS-24 isn't just for vinyl cutting. It accepts a range of additional materials (two inches to 27.5 inches wide), including paint mask, twill, heat transfer and sandblast material. The GS-24 does it all. The GS-24 features state-of-the-art overlap cutting (up to 10-times), half or perforated cutting, and the ability to cut by line color. Now, complicated workflows are easier than ever. Strength comes from within. Crop Mark Recognition - With included optical registration system, the GS-24 recognizes desktop printer crop marks, perfectly aligning the media to create, precise cuts each and every time. Speed That’s Spot On - Thanks to a highly innovative digital servomotor, the GS-24 can handle vinyl cutting assignments, as well as cutting jobs involving other types of materials, at speeds of up to 20 inches per second. But speed without accuracy doesn’t mean anything. That’s where our curve-smoothing function comes in—precisely cutting at the highest speeds to optimize productivity and efficiency. Specially-designed to harmoniously work with Roland products, Roland CutStudio software (included) allows you to quickly, easily, and effectively enlarge, reduce, reposition, rotate, and mirror images. The GS-24 also cuts oversized images using an improved tiling function, and even cuts true type fonts without the need for outlining. Supports BMP, JPG, STX, AI, and EPS file formats, as well as the ability to cut directly from Adobe Illustrator or Corel Draw. 3 Year WARRANTY We have your back - The innovative features, outstanding versatility and incredible ease of use of the GS-24 are just the beginning. 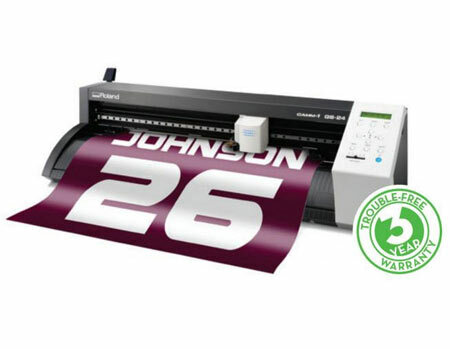 With Roland, you get a product known for day-to-day reliability and long lasting durability. To back it up, the GS-24 comes with an industry-best 3-Year Trouble-Free Warranty*. Offers a maximum cutting width of 22.9"
Your Printer + Our Cutter= Bigger Profits!